In the “Solution” presented it was suggested that the existing US bonds be required to invest in companies in the USA. Does the govt just print the money for the bond values to give to the companies? If the companies receive the bonds, how are they liquidated otherwise? ANSWER: It becomes a debt for equity swap. The debt must be retired. It is replaced with just the creation of money. Now people will yell that is hyperinflationary. Not true. Since 1971, government debt is acceptable for collateral when you trade your accounts at a broker. It is simply cash that pays interest. It is already part of the money supply. What you are implying is really old school economics that believe increasing the money supply will be inflationary. This is just not the case. Even after 10 years of Quantitative Easing, we still have deflationary trends in pockets like Europe and Japan. Some wrongly believe that you are just increasing the money supply. Pre-1971, when bonds were not allowed to be collateral, then yes, it was less inflationary to borrow than to print. However, since the debt is already cash that now pays interest post-1971, it is just a swap. Huge distinction. 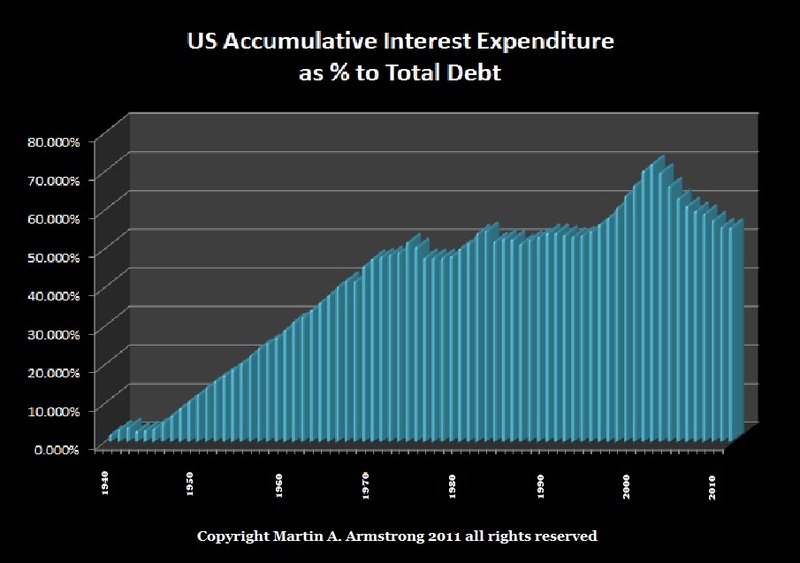 Interest expenditures will soon exceed that of the military. This solution will reduce the cost of government, and thereafter, you outlaw any possible right to borrow once again.